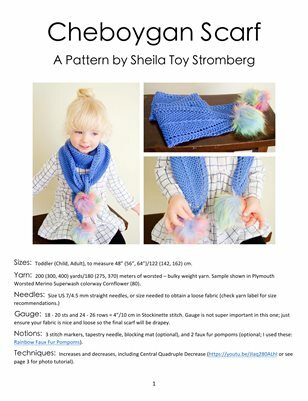 A shop copy of Cheboygan Scarf for toddlers - adults. This speedy little scarf is a fun way to use beautiful, heavy yarn. It will work up quickly and the pattern is really easy to memorize, making knitting it kind of a no-brainer after the pattern is established. Sizes: Toddler (Child, Adult), to measure 48” (56”, 64”)/122 (142, 162) cm.